This past Saturday morning at Elliot Park, Northwestern students and Evanston residents alike could be seen celebrating one of the first warm weekends of spring wielding shovels and garden gloves. Harbert, Elliot, Twiggs, and James Parks all underwent arboreal makeovers as 100 young trees were added to Evanston’s canopy. 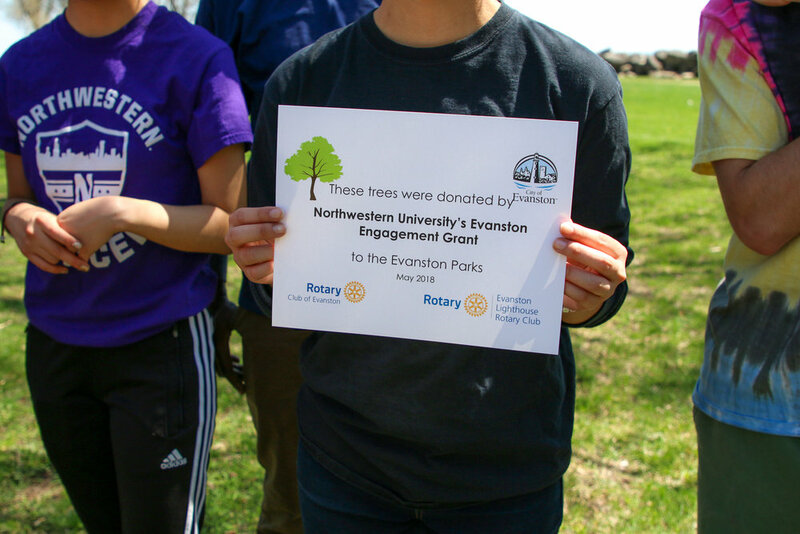 Along with the young trees, Trees for Evanston Parks planted the beginnings of a fruitful relationship between Northwestern University and the Rotary clubs in the area. 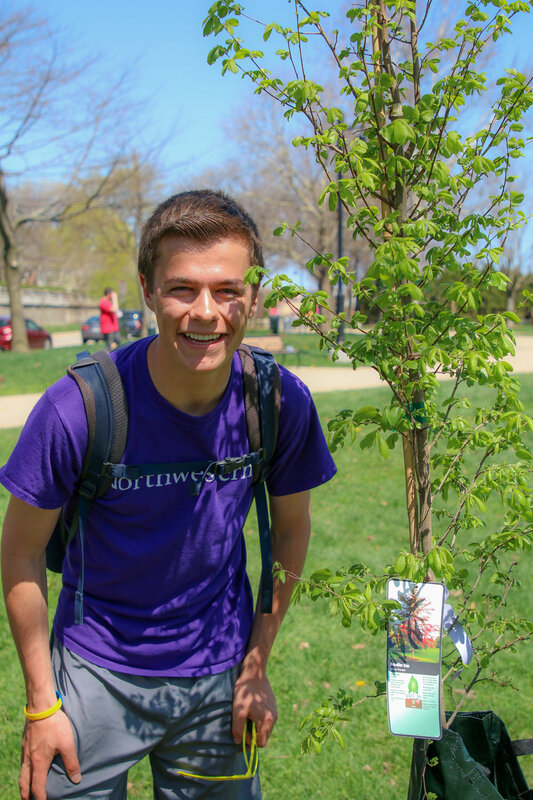 Two of Northwestern’s on-campus environmental groups, In Our Nature and SEED (Students for Ecological and Environmental Development), invited club members to attend the event and assist in tree planting. Trees for Evanston Parks is the brainchild of the Rotary Club of Evanston and the Rotary Club of Evanston Lighthouse as a solution for the significant loss of trees in Evanston due to disease. Members of these Rotary clubs reached out to Evanston Environmental Services Bureau Chief and City Arborist, Paul D’Agostino, to see what types of trees to plant and where to plant them. They resolved to plant Kentucky Coffee Trees, Eastern Redbuds, Frontier Elms, River Birch, Burr Oaks and Shingle Oaks in tree-thinned Evanston parks. In order to pay for the trees, The Rotary clubs offered Evanston residents the opportunity to purchase trees in honor of family and friends. Patrick Mbullo, Northwestern anthropology graduate student and Rotary member, saw an opportunity for the University and university students to participate in the larger community. He applied for Northwestern’s Evanston Engagement Grant and received $975, enough to pay for the planting of 13 trees. He then reached out to environmental organizations on campus and invited them to Elliot Park to help plant the trees paid for by this grant. After a quick, city arborist-led demonstration of how to plant the young trees, volunteers dispersed around Elliot Park to dig holes and plant the young trees before mulching and covering them with a protective tarp. Rotary members, Evanston residents, and Northwestern students mingled as they worked. After the trees were planted, food and drink were provided at a downtown Evanston restaurant, Celtic Knot. “We have a number of students who have come from NU, quite a number of community members who are here, and we have the city guys around teaching people how to plant the trees. It is a combination of Northwestern, Rotary clubs of Evanston and also city management,” says Mbullo. Sanders and Mbullo both saw the premier event as an overwhelming success. Trees of Evanston Parks will be planting again in the fall.